Great memories have been given to us during the World Cup. People have reflected upon these memories and given some of the best quotes ever. Therefore, we have gathered the 5 best quotes from the World Cup. "The Belgium defence – they're not all Ferraris there, you know. They have some Skodas too. Algeria met Belgium in their first game in the 2014 World Cup in Brazil, and the Algeria coach Vahid Halilhodzic made this great quote. The Belgium’s golden generation had, and still has, a lot of great defenders. You could argue that Halilhodzic made this statement to give his players more confidence before the game, which they lost 2-1. That gentleman will never set foot in Perugia again. I have no intention of paying a salary to someone who has ruined Italian soccer. This might be one of the one of the weirdest quote and action ever. Ahn Jung-hwan and South Korea played against Italy, which they sent out in Golden goal. The hero was Ahn Jung-hwan, but in Italy he wasn’t that appreciated. He used to play for Perugia Calcio at that time, and the President of Perugia Calcio said this famous quote. Ahn got his contract terminated and shouldn’t go back to Perugia. The president even said that Ahn only played well against Italy and did never that well at Perugia, hence he destroyed Italian football. Maradona made this cheeky quote after the game against England in the 1986 World Cup. Maradona said this after his ‘Hand of god goal’ against England, which sent England out in the quarterfinals in 1986. The game was known for 2 goals. Firstly, the hand of God goal, which got the name from the quote Maradona said, and the second goal, which was called the goal of the century. Here Maradona ran through the whole England team by himself, before scoring the second goal of the game. If we beat Costa Rica I want a kiss, obviously on the cheek, from the UK Queen. 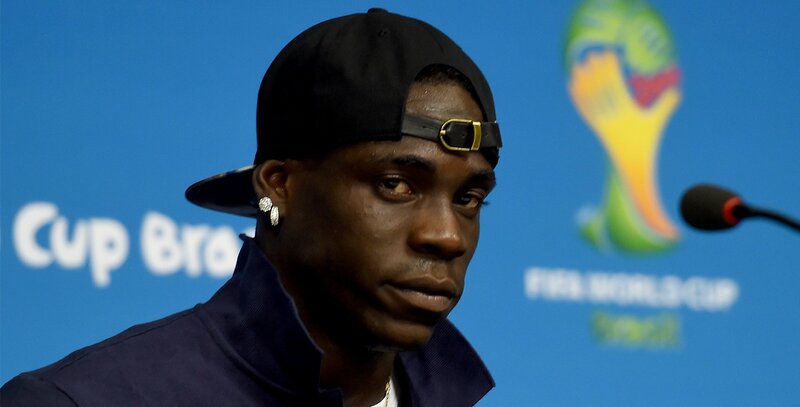 England were on the brink of elimination after their 2 losses in the World Cup 2014 group D. Therefore, it was more than suitable for Balotelli to make a comment on Englands matches, and made this funny quote. But he shouldn’t have been that cheeky, because they lost their next to matches which meant that both England and Italy were eliminated from the group stages, and Uruguay and Costa Rica went to the playoffs. I lost my balance, making my body unstable and falling on top of my opponent. I hit my face against the player leaving a small bruise on my cheek and a strong pain in my teeth.